Do Roman Catholics and Muslims Worship the Same God? Does It Matter? Pope Francis hosts an inter-faith prayer meeting for peace between Israel and Palestinians in the (consecrated?) grounds of the Vatican, 8th June, 2014. 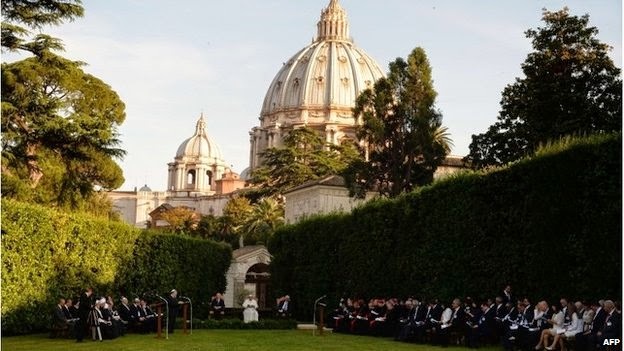 Representatives of Judaism, Islam and Roman Catholicism participated. Do Roman Catholics and Muslims worship the same God? 841 The Church's relationship with the Muslims. "The plan of salvation also includes those who acknowledge the Creator, in the first place amongst whom are the Muslims; these profess to hold the faith of Abraham, and together with us they adore the one, merciful God, mankind's judge on the last day." [italics mine]. The catechism is quoting the Vatican II document, Lumen Gentium (Dogmatic Constitution on the Church; LG 16). While the authority of the Catechism has been the subject of some debate among Catholics, with even some bishops averring that it mixes theological opinion alongside authoritative doctrine, the doctrine taught by a Council in communion with the Pope is infallible and calls for the full assent of faith from the loyal Catholic. Therefore, one must conclude that the Roman Catholic Magisterium teaches its adherents that they and Muslims do adore (i.e. worship) "the one merciful God, mankind's judge on the last day." Having answered our first question in the affirmative (according to the Roman Catholic understanding, that is), we now move on to our second question: Does it matter? Firstly, Roman Catholic teaching on this subject misrepresents the teaching of the Quran, but that does not concern us nearly as much as how this misrepresentation impinges upon the Christian doctrinal of God: Allah is not "the one merciful God who will be mankind's judge on the last day". To make this assertion is to veil with error the light of the Gospel which God has given to the church as the means to salvation for all people. The second and more serious error in the assertion that Catholics and Muslims adore the same merciful God who will judge us on the last day is a misrepresentation of the Christian doctrine of God. The Christian God is a communion of three Persons whose nature is Love, who, in the Person of the Son, condescended to take on human flesh in order to redeem fallen humankind from the powers of sin, death and the devil, graciously leading us back into the Divine communion of love. The Allah of the Muslims is al-Jabaar, the supreme potentate of the universe who commands that all creatures submit to his will, even at the point of the sword. To identify these two theologies does not give glory to God the Father, Son and Holy Spirit but leads to the syncretism of multi-faith services. Why does Roman Catholicism so glibly fall into the error of identifying Allah with God the Father, Son and Holy Spirit? Comments welcome. Part II to follow, D.v..
Lutherans Do Not Believe in Consubstantiation, OK? Lutherans do not subscribe to the theory of the 'how' of the 'real presence' called consubstantiation. But if you received your orientation to Lutheran doctrine only from evangelical Reformed dogmaticians, you might be excused for thinking so, for in my experience that is how they almost unanimously represent the Lutheran doctrine of the 'real presence' of our Lord's body and blood in the Lord's Supper (even the Anglican scholar Alister McGrath, who wrote a decent study of Luther's theology of the cross, did so in his Christian Theology). The latest example of this egregious misrepresentation comes from Australian Anglican theologian, Michael L. Bird, who holds a PhD from the University of Queensland in my home city of Brisbane and teaches at Ridley Theological College in Melbourne. 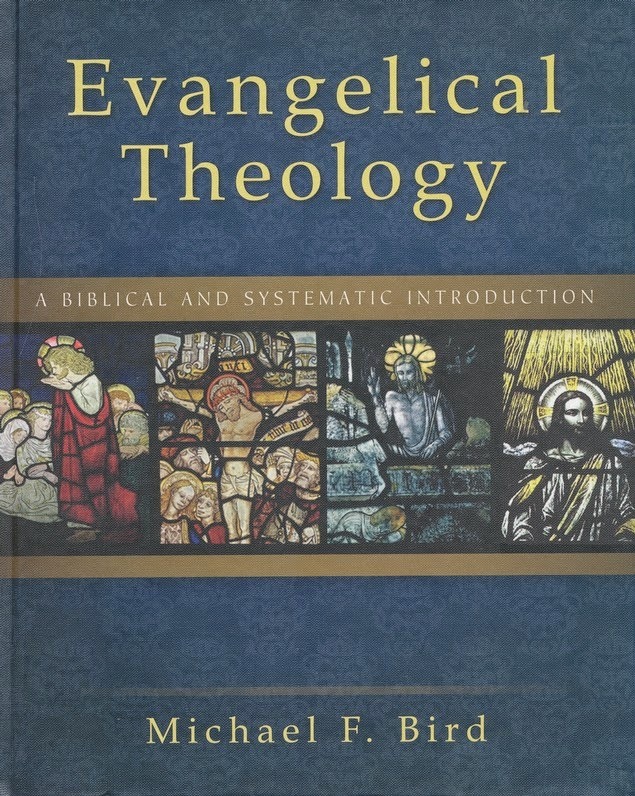 In his systematics text, Evangelical Theology (Zondervan, 2013; pictured), after correctly describing the Lutheran doctrine as a reaction against the Roman Catholic doctrine of sacrifice, Bird also correctly notes that Lutherans still hold to a 'real presence' in the sacrament of the altar, a position which he says is called consubstantiation. No reference to the primary literature of the Lutheran Confessions is made to justify this terminology; in fact, if Dr. Bird had checked, he would have found the term is never used in them! Disagree with the Lutheran teaching if you must, Reformed theologians, but please, if you write about it, at least take the trouble to represent it correctly. Let ma also say that any theology which permits philosophy to be a guiding principle cannot be truly evangelical.